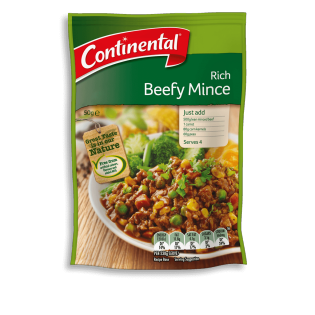 Continental's delicious rich beef mince recipe base is the perfect fast and simple hearty dinner classic. Learn how to create this dish here. Wheat flour, corn starch, maltodextrin (from wheat), burnt sugar, salt, onion powder, soy sauce powder (contains wheat), pepper, sage, natural flavours, sunflower oil, garlic extract.